Two huge buttons and a plastic sword hilt? Just what the doctor ordered for your collectible card game. 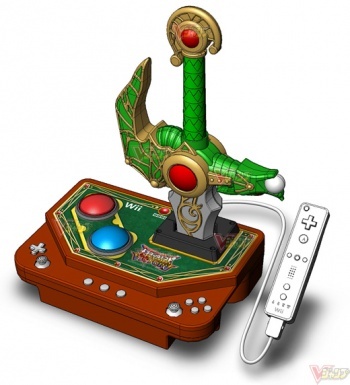 Square Enix is bringing card-based arcade game Dragon Quest Monsters Battle Road Victory - a mouthful and a half of a title - to the Wii, and to celebrate its arrival, is creating a huge custom controller to simulate the arcade experience. The controller has two big buttons and a sword hilt sticking out of it that you press down to activate special attacks, and if the images of it are to believed, it's not exactly a small device. The controller will retail at around ¥12,800, or about $137, which means it costs more than twice as much as the game itself will. Thankfully, the arcade controller is optional, as you'd have to be a pretty dedicated fan to buy it at that price.